While there have been several attempts to bioengineer cardiac tissue for transplant in vitro using starting from cells seeded onto a scaffold, so far these efforts have been hampered by difficulties in getting the capillaries necessary to supply blood to enable the muscles in the tissue patch to grow properly. Due to these difficulties engrafted heart patches have until now had limited benefits on heart function in animal models of heart attack, and consequently this approach has not yet been assessed in human clinical trials. In this project the scientists at Ben-Gurion University started with a similar approach to that used previously by other scientists. They grew the patch of tissue from neonatal rat heart cells which were seeded in scaffolds designed to allow cardiac cell organization and blood vessel penetration after transplantation, and supplemented them with a mixture of growth factors that encourage cell survival and blood vessel growth. 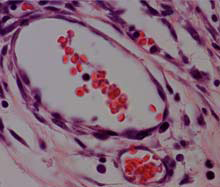 After the cells had been cultured in vitro for 24 hours to allow initial organization of the cells within the scaffold they introduced a new step, implanting the patch into the rat omentum, an abdominal tissue that is particularly rich in blood vessels, in the hope that the interaction with the blood vessels of the omentum would encourage the development of mature blood vessels in the heart patch. They observed that the blood vessels of the omentum connected with those developing in the heart patch, encouraging blood vessel development and growth of cardiac muscle. The real test came when they compared the ability of omentum-grown heart patches to repair tissue damage in rats which had undergone experimentally incuced heart attacks 7 days earlier, with that of heart patches that had been grown in vitro. The result was clear, the omentum-grown heart patches had better blood vessel and muscle quality than the in-vitro grown patches and integrated more strongly into the heart. When they examined several parameters of heart function they found that the hearts of those rats which had received omentum-grown patches worked better than those of control rats and those which had received in-vitro grown patches. So what does this mean for the treatment of heart attacks? The authors point out this is a relatively straightforward procedure that could be assessed in human trials, but also caution that the extra surgery required to grow the heart patch on the omentum would be to risky for many elderly or ill patients so it is a procedure suitable for only a minority of heart attack patients. What the authors suggest is the development of in vitro bioengineering techniques that mimic the influence of the omentum on the growth of blood vessels and muscle within the heart patch, and with this study they have begun to determine what the requirements of such in vitro systems are. Needless to say as such in vitro techniques for stimulating heart tissue growth are developed they will need to be assessed in animal models of heart injury before they can enter clinical trials in human patients. Next Next post: Violence vs Non-Violence? The AR Debate!